New book, 48 pages, NVG086. 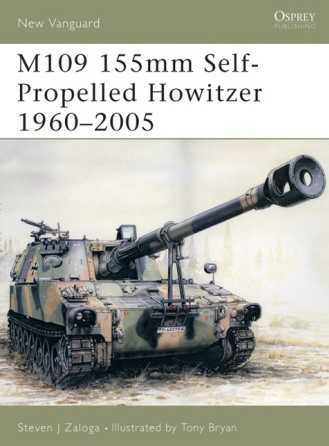 Entering service in the early 1960s, the M109 Self-Propelled Howitzer has been in production for 34 years and forms the backbone of US Army and Reserve artillery units. The M109A6 is the latest development of the M109 series and incorporates advanced fire control systems that enable it to have its first rounds on target less than 60 seconds after arriving at firing location. This ability to shift quickly between moving and firing modes avoids counter battery fire and ensures battlefield survivability. This book details an impressive and versatile weapon that has served around the globe in Southeast Asia and in Operations Desert Shield and Desert Storm. Contents: Introduction; Cold War Origins; First combat: Vietnam; Long range firepower; Enhancing lethality; Mid-east combat; Precision guided munitions; The modernization dilemma; Feeding the guns; Operation Desert Storm; Operation Iraqi Freedom; Internation Programs; Bibliography; Color plate commentary; Index. This item was added to our catalog on Wednesday 05 December, 2007.